In 1968 oil company researchers located vast oil resources in Alaska's North Slope region. 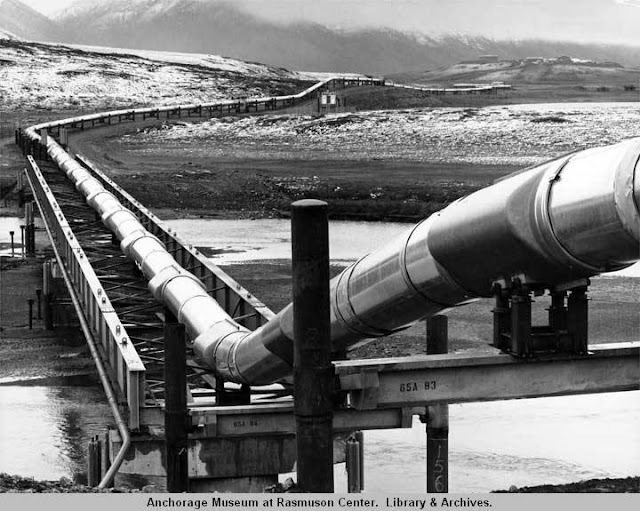 Founded in 1970, the Alyeska Pipeline Service company designed and built a pipeline extending southward from northern Alaska to Valdez in the south central region. The company employed over 60,000 people in the course of three years in order to build what was the largest construction project in national history. 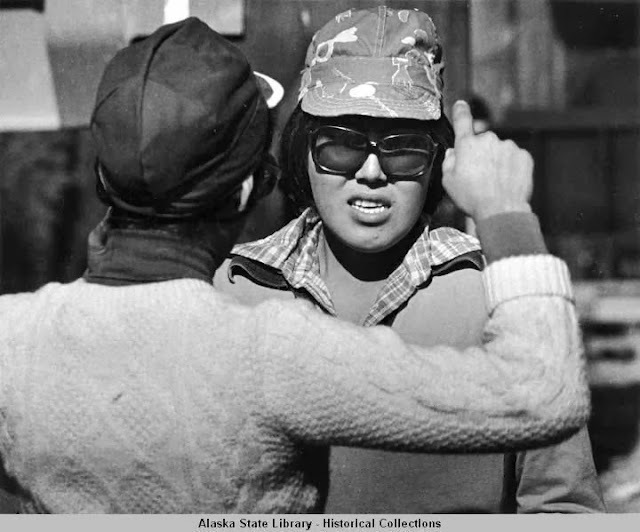 The Alaska Federation of Natives and the Alyeska company worked on a plan to to hire 3,000 Native people, a plan that was encouraged by the Secratary of the Interior at the time. The company hired almost twice as many Natives in the duration of the project. Consequently, ten percent of the Alaska Native population directly contributed to the building of the 800 mile long project. While the majority of those employed on the pipeline came from the interior region of the state, studies show that Natives from all areas were involved at various levels. Most often workers held a succession of jobs, strung together over time. According to one study, 5,770 Native workers held 15, 047 jobs. Around 30 percent of Natives seeking work enrolled in government funded programs as well as took advantage of on-the-job training the company provided to workers. One report I'm reading asserts that over fifty percent of these jobs were no longer than eight-weeks in duration. In fact, a quarter of all Native employees worked for two weeks or less. Over 46 percent of job termination consisted of "involuntary discharge." However, company counselors suggested that the reason Natives discontinued working these jobs was due to the social environment. Many Native workers felt isolated and felt varying degrees of prejudice against them from other workers. Males represented 57 percent of the Native workforce and the statistics show that "men were more likely to quit" their jobs earlier than women. 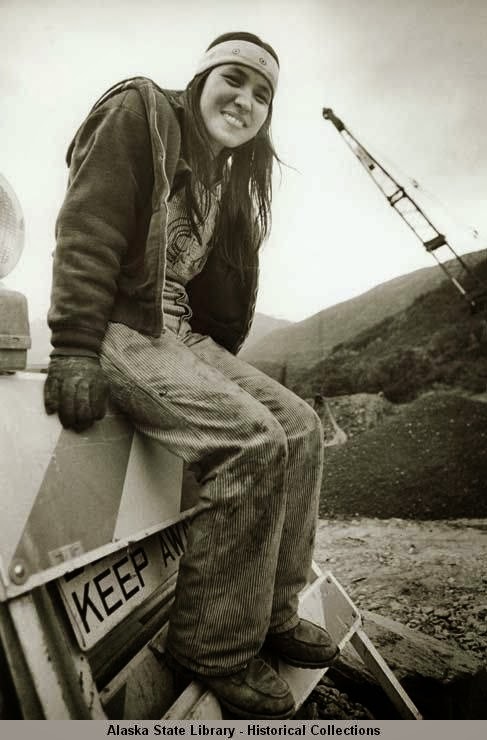 Around 7 percent of all pipeline workers were women. The statistics show the majority of jobs held by women more generally were "bullcooks," "typists," and "laborers" and men were more likely trained as "craft-affiliated workers." Within this gendered-workforce I haven't located the number surrounding "involuntary discharge" by gender. Regardless of position, I would think being employed on this project involved grueling work. 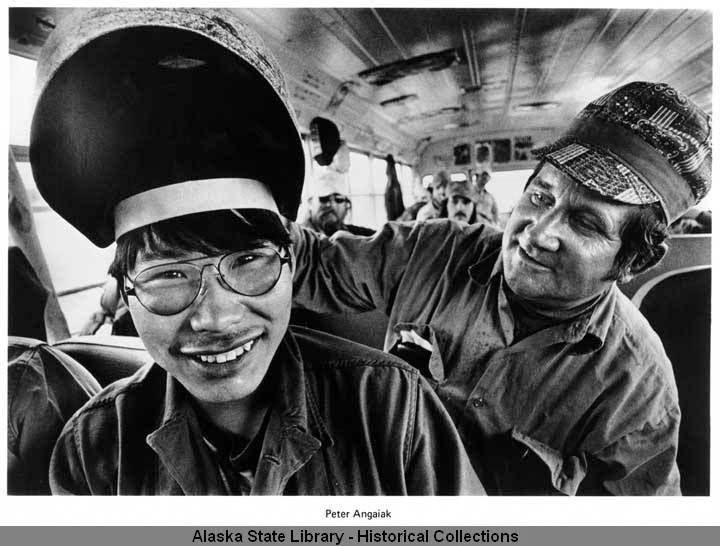 Below is a picture a young man wearing a flipped-up welder's mask on the shuttle to or from the jobsite. Across the board, pay range averaged 1,000-1,500 dollars a week, but for Natives who supplied the labor for positions with short training periods their average income was about 800 dollars a week. I haven't been able, just yet, to find pay differentials between Native women and men. 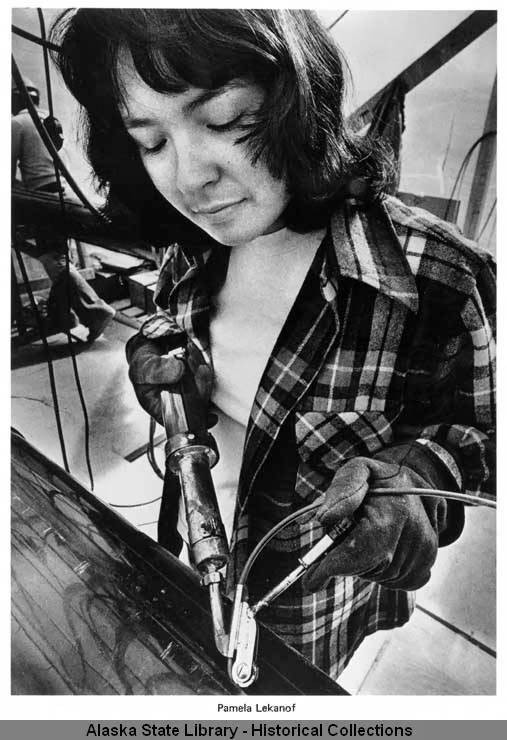 "Welder's helper employed by Trans-Alaska Pipeline." "Native girl in big sunglasses and hat, employed as welder's helper south of Chandalar." Pipeline Impact Photograph Collection, 1974-1977. ASL-P17-8032. While one researcher suggests seasonal subsistence practices being a main possible reason for Native workers to leave their jobs at the pipeline, another reason could be the loss of Native workers to other industries, aligned with subsistence practices. 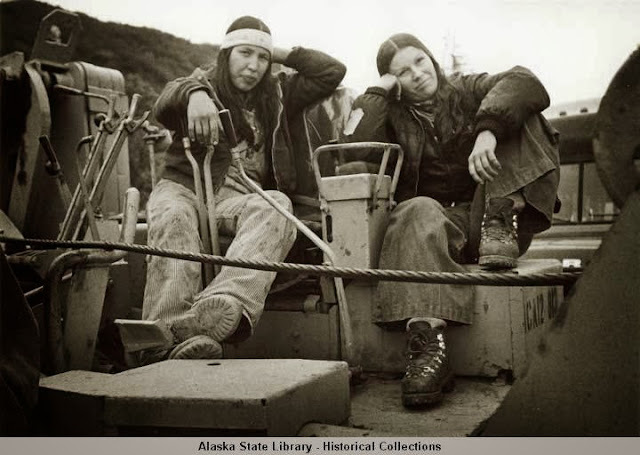 In the 1970s the Alaskan fishing industry was booming and perhaps many of these workers quit as to return to work on boats or in canneries located within their hometowns? Less than ten percent of Native employees were "discharged with cause" and the majority left on amicable conditions.